The quick destruction of this film is fascinating. Here’s the chain of events… Remember those inspiring trailers last Fall positioning this film as a mondo-Oscar contender? A classic story about the triumph of the human spirit , featuring the red hot Robert Downey Jr (his third film that year), Jamie Foxx as a schizophrenic homeless man and former Juliard cello student, directed by Joe Wright, who had two acclaimed Academy Award nominated films under his belt (Pride and Prejudice, Atonement). Suddenly and inexplicably the release got knocked back outside of the Oscar race. Fast forward to April of this year. The once prominent "The Soloist" gets dumped in the market to critic sharks looking to pounce on and devour the already crippled film. A lowly rotten tomato meter of 54% was the final kick that broke this once mighty project. Now it’s on DVD, and though it’s not as bad as this far fall might suggest, it’s a missed opportunity. You know the story, Downey plays Steve Lopez an LA Times reporter looking for inspiration for his next story. 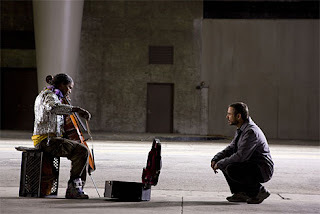 He finds it in Nathaniel Ayers Jr (Jamie Foxx), a homeless man whom he meets playing a two-string violin with grace. A minor mention of Juliard, the renowned music school, prompts Steve to look into the backstory of Ayers. He discovers a sad story of schizophrenia which afflicted the poor child, once a promising talented classical musician, now one of 50,000 other scared street people in Los Angeles. Lopez says to his girlfriend, 'he's never loved anything as much as Ayers loves music.' It is for this reason Lopez attempts to pick Ayers up and put him back on the right path. Ayers accepts the friendship but haunting memories and his schizophrenia is the barrier he needs to cross - of which only his music, his new friend and a long lost family member can help. There’s only about 45mins of a good film in the there. Downey as usual is interesting to watch, and the set-up and careful feeling out of the friendship provides a wonderful stage for Foxx and Downey's acting skills. Like the advice Downey’s character dishes out on “Tropic Thunder”, Jamie Foxx smartly doesn’t go ‘full retard’ on Ayers. Though he’s prone to inchorent ramblings and voices in his head, the human aspects of Ayers never went away, he's capable of carrying on a conversation and despite his life on the street he's sociable and unjaded. Wright clearly knows the antecedents of this story – “Shine”, “One Flew Over the Cuckoo’s Nest”, even a bit of “The Elephant Man”. He steers away from the melodramatic clichés of these films, but at the same time presents a dull, uninspired rendering of the film’s central conflicts. Lopez desires to help Ayers, and though he is having domestic troubles, the significance of his new friendship with his own life never connects. And so Lopez comes off as more of a plot device than a character. His voiceover which uses the real Lopez’s actual written words presents a creative alternative to expository narration, complimenting the theme of creative writing in an ever-shrinking world of traditional journalism. Foxx as Ayers is interesting. In the present he is compelling. His said but magical eyes tell us there’s a passionate student of music hidden beneath his unruly exterior which protects him against his lifetime of psychological demons. Unfortunately Wright makes a fatal flaw of using flashbacks to show his journey from promising young kid to homeless schizo. None of it is necessary, and reduces the power of Foxx’s performance in the present. The second hour coasts with little narrative momentum on the same conflicts, without broadening our understanding of homelessness, Nathaniel’s predicament or Lopez’s goals. Wright's inconsistent direction comprising of his usual floating camera, some authentic street wise documentary-like verite, melodramatic elegant sweeping cranes moves and a number of other visual embellishments which attempt to capture the beauty of music is representative of this mixed bag with the whole less than the sum of it's parts.